1. It wont let me edit. Every time I change something in dbf datadase it goe's back to what it was. - Toggle Edit button on, click on the appropriate cell, edit the data, and to savethe changes press Enter. 2. Can I use DBFView to undelete or delete items in dbf file extension? - Just click on icon to the left of the record. 3. When printing a dbase file, sometimes I do not want to print all the fields, only afew (e.g. only the name and address, and not children's names etc.). Can thisfeature be implemented? - To print needed fields only, change the order in which they are displayed by drag anddrop the header. You can also change the printed width of column by moving the headerdividers. If you do not want print the field, set the field width to zero. 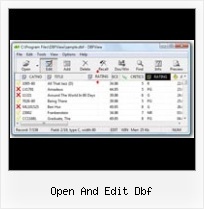 DBF Manager - dbf file viewer, dbf editor and dbf index file The sophisticated data editing, data conversion and search-replace features are all So, you should open a .dbf file firstly and then associated index file(s) if needed. 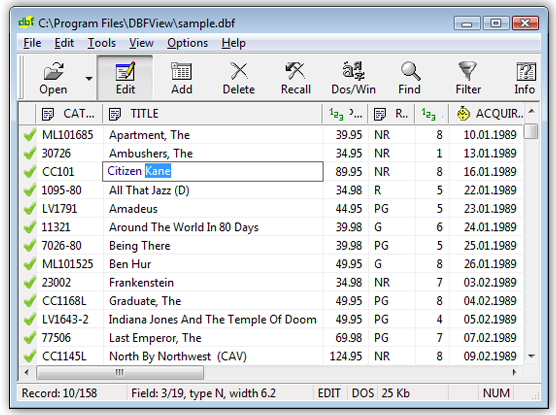 DBF Viewer - dbf viewer, dbf file editor, dbf manager It also offers comprehensive data editing, data conversion and sophisticated search So, you should open a .dbf file firstly and then associated index file(s) if needed. How To Open Dbt File : DBF Viewer, DBF Editor, DBF Convertor How To Open Dbt File DBF Foxpro Viewer is a compact but powerful tool for opening, viewing, editing, converting and printing DBF databases. Freeware DBF Opening Databases Open and viewing DBF File. Filtering on multiply fields to query data. Printing Tables and preview ; Add, Edit, Deleting and Updating records.